Now their unity has paid off in big ways. 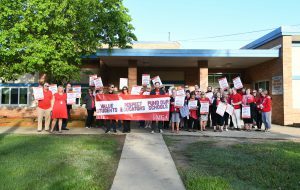 After the conflict over Wear Red Wednesdays last spring, Charlotte Education Association President Julie Davis was approached by three school board members wanting to schedule a talk with her, the local’s co-president, and Superintendent Mark Rosekrans. Two new full-time “student support specialist” positions have been posted for hire to help struggling students at the middle and high schools. An existing student support specialist who has been splitting time between 1,000 students at the upper elementary and middle schools will be assigned to the elementary school full-time. Two lower elementaries are sharing a support specialist as of now, but “we could add another next year if needed,” Davis said. The new staff members will be degree-holders in social work or a related field who help students navigate social, emotional, and academic difficulties through assessment, monitoring, counseling, and coordination of school and community resources. In Charlotte, educators who joined walk-ins at several buildings in the district said years of budget cuts left students without needed supports – from social workers to supplies and substitute teachers. Union leaders complained about the district’s nearly 20 percent fund balance held in reserve, and staff morale was at a low point. In fact, so much progress has been made that the administration agreed to design a new red t-shirt in coordination with the Charlotte Education Association. The front of the shirts will read, “We’re all in this together,” Davis said. In the CEA’s design for the new shirts, puzzle pieces are coming together representing teachers, administrators, school board members, bus drivers, custodians, paraeducators, students, parents, and all members of the school community.